In-form Derek Riordan netted three times as Hibs swept Kilmarnock aside at Easter Road. The result cemented Hibs’ position as the best side in Scotland outside the Old Firm, and further enhanced their reputation for eye-catching play. Riordan’s 15th goal of the season and his first of the afternoon arrived with Stephen Glass, one of the few experienced players in the home side, having done well down the left. The former Scotland internationalist pushed the ball past his man and just managed to cut it back into the danger zone. Riordan was the man it reached and after a sublime shuffle of feet to set himself up he stroked a perfectly placed shot past Alan Combe on the half hour. Goal number 16 arrived four minutes later and again Combe was given no chance. Dean Shiels produced an earlier defence-splitting pass and, from Garry O’Connor’s cross, Riordan flicked the ball high into the net. Riordan could have had a hat-trick before half-time as he had earlier been denied by a goal-line clearance from Garry Hay after Combe had blocked a shot by Steven Fletcher. 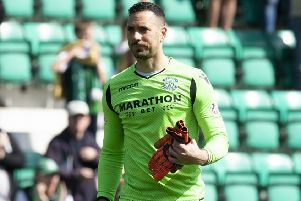 Killie striker Kris Boyd could also have laid claim to the match ball by the break but was denied three times by Hibs goalkeeper Simon Brown. Brown blocked with his legs on ten minutes after Boyd had been located in space on the left of the penalty box. The English keeper then produced a reflex tip-over of a shot on the turn from even closer after Danny Invincibile headed on a throw-in. Brown also made a point-blank block from Boyd that would have put his side back in the game after Riordan’s rapid double. Boyd had a header saved by Brown before Riordan once again showed him how it was done with goal number 17. Again Glass was the architect with a run and pass to Fletcher on the right. Fletcher made a hash of his first attempt to find a colleague but was lucky with the bounce and got the chance to try again. No Killie marker had picked up Riordan on the left of the box and that error was punished by a low, hard drive that flew past Combe. The Killie keeper then had to save his side twice in the space of a few seconds. First he made a close-range block to deny Shiels and, after a defender had hacked away Guillaume Beuzelin’s follow-up, he had to tip over a thumping drive from Gary Caldwell. Late on, Combe pulled off a fine save to deny Glass, who fired a 25-yard free-kick towards the goalkeeper’s bottom left-hand corner. Hibs: S Brown, Whittaker, I Murray, Caldwell, Smith, Shiels, A Murray (McCluskey 76), Glass, Riordan, O’Connor (Morrow 64), Fletcher (Beuzelin 54). Subs not used: A Brown, Murdoch, Murphy, Orman. Kilmarnock: Combe, Fowler, Ford, Lilley (Johnston, 46), Hay, Invincibile, Locke, McDonald, Naismith (Dodds, 66), Boyd, C Nish (Murray, 56). Subs not used: McGregor, Johnstone, Smith, Wales.